With this exchange in the first lesson, J was hooked on Middlebury Interactive Languages. J has been wanting to learn another language, preferably Spanish or Hawaiian, since her sisters are learning those languages. However, programs we have experienced are not easily accessible to a pre-reader or early reader. 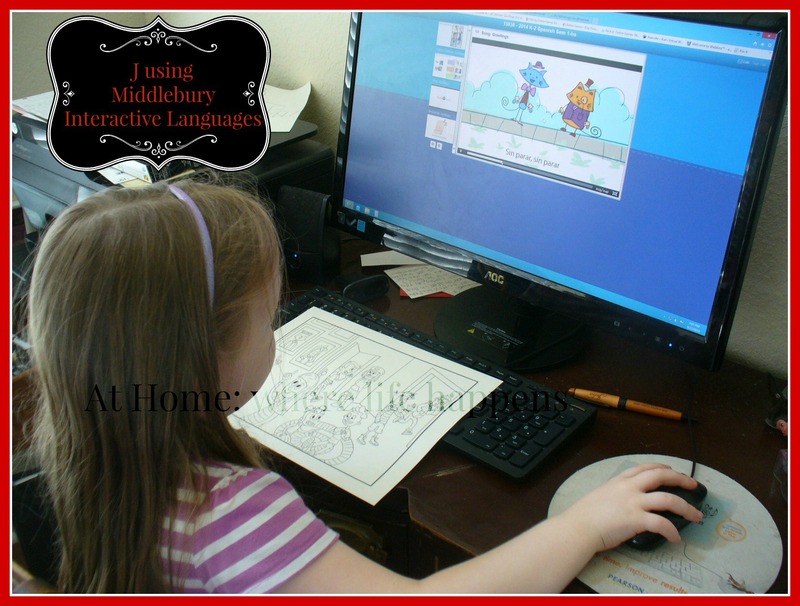 She was ecstatic when Middlebury Interactive Languages came up. It has been a great fit. 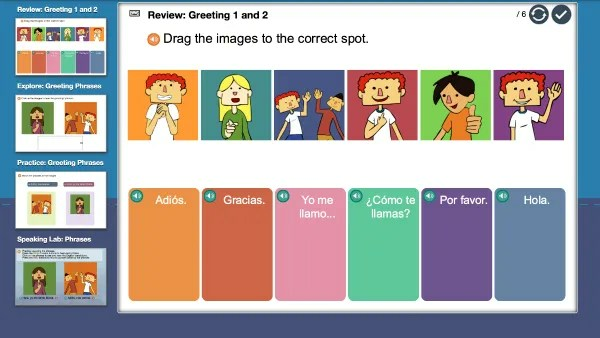 J is using one of the Spanish Courses, specifically Elementary Spanish 1, Grades K-2. She is using the course without a teacher but there is an option with a teacher. I do not know the details of the differences in the program when you add a teacher. She is five years old and working at a K/1 level so she fit this age group well. Middlebury has done an excellent job of exposing the students to a lot of vocabulary in the immersive approach that they employ in their programming. An immersive approach to language learning implies that the students will be surrounded by that language and it will be the primary focus of the learning that happens. Each unit contains an story, myth, or legend from a Spanish-speaking culture and the materials for that unit are built on the story, myth, or legend. The K-2 lessons focus mainly on vocabulary. The student learns these words through stories, songs, games, and various practice activities. Middlebury uses the immersive approach effectively. You can read more about Middlebury’s use of the immersive approach and their development of these lessons on their website. The very first lesson J logged onto began with a click-to-color activity on greetings. Next, she saw a folk tale told entirely in Spanish. It was illustrated with cartoon characters and the words (in Spanish) were on the screen as they were said. It was done in such a way that she paid a lot of attention to it. She picked up several words and their meanings just by watching that folk tale. She was also exposed to some important elements of the culture. In order to ensure that the student understood the elements that were the focus, there was a review and a repeat of the folk tale. This was followed by three practice activities using the greetings from the folk tale in different ways. 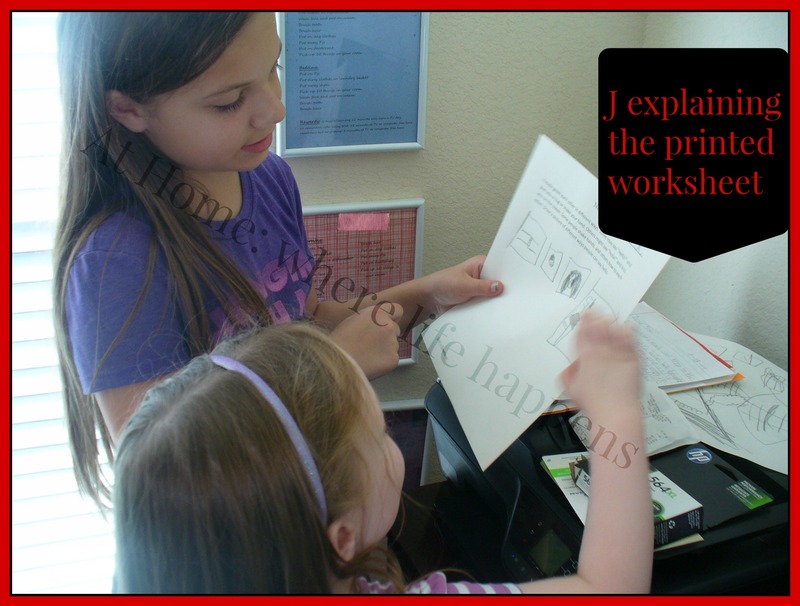 The lesson ended with a speaking lab where the student can listen to the word or phrase, record their own speaking, and compare their pronunciation. Two of the pages to print out and complete. Throughout the lessons that J has completed, the activities have been varied. Some of the activities and teaching modes used have been a video, click-and-drag activities, coloring pages to print off and use, click-to-activate activities, putting things in order, worksheets to print off and complete, answering questions, speaking labs, and more. 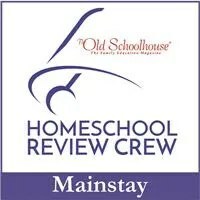 The variety of activities has been a definite bonus and has helped a lot in making this a program that J enjoys using. She looks forward to using Middlebury because within each lesson there are a minimum of 5 different activities. One example of the activities that the student is given. 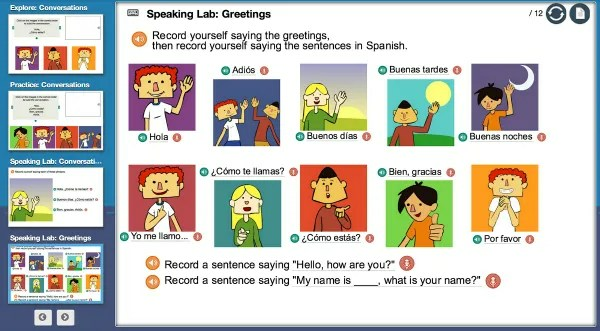 Each lesson includes what is called a speaking lab. This is an activity that includes a button to click on to hear the program speak the word or phrase. Then it is the student’s turn to record their voice saying the same word or phrase. To do the recording, we used a Logitech camera that plugs into a USB port and has a built in microphone. It worked well on our desktop computer. We would just plug the camera in, hit record and then click allow (only had to click this the first time after it was plugged in), and then speak to be recorded. J really liked having the microphone available to record herself and listen to her pronunciations. She seems to have a pretty good ear for languages and was able to correct some of her pronunciation just by listening to the program and them listening to herself. This was one of the bonuses of Middlebury. An example of the Speaking Lab. Middlebury Interactive Languages has a dashboard where you can access the lessons via the calendar or the table of contents, as well as accessing the grade book. For our family, the grade book was not very important. It does show the grade for activities that are graded. They are graded by whether or not the student got the answers correct and it doesn’t affect the student’s ability to move on. If you have a need to see each activity and the date it was completed on, you have to make sure that you check the box “show course work” in the upper right hand corner or you will only see the quizzes and tests. If you need to be able to print a grade report, you have that ability. The only “complaint” that I have about the dashboard is that it is awkward. It is not intuitive to use but it is not all that hard to figure out. One other thing that was a little bit strange is the way the lessons were scheduled. Middlebury suggests 2 – 3 lessons per week for K-2. For us, the lessons were scheduled on the calendar with five a week. This means that if we looked at the calendar, we were behind. Additionally, that shows up on the grade report. It shows as a due date and a completed date for the course work. This means that the student’s dates will be show up as late after the first day. I don’t know if this is typical scheduling for Middlebury or not. It didn’t bother us at all but is just something to be aware of. Middlebury Interactive Languages is an online course. You will need a computer with internet access to be able to use this course. For the Elementary Spanish 1, K-2 course, the microphone is optional but definitely made a difference in the experience. You will also need to register and pay for the course of your choice. The Spanish Courses differ in cost. The Elementary Spanish 1, K-2 course is $119 for one student for one semester without a teacher. This is definitely a well-liked program here. J asks all the time to be able to do a lesson. Of course, that distracts E who wants to be a part of the lessons. She is ten and in the 5th grade but these lessons are still fun for her to do and be a part of. We try to schedule the lessons so that J can run the computer and answer the questions with E sitting beside her. But, if we can’t do that, E just comes and redoes a lesson. That is easy to do by just clicking the lesson from the table of contents or calendar and starting it over. It is not graded after the first time a student goes through the activity but that didn’t matter for our purposes. So, Spanish will continue in the lesson plans with J and E enjoying the unique way Middlebury presents the language. At Home. 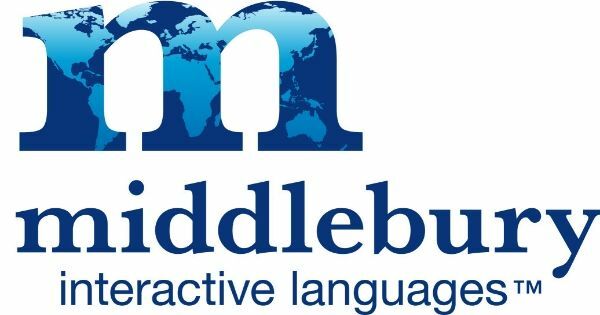 You can connect with Middlebury Interactive Languages on social media through the following links. 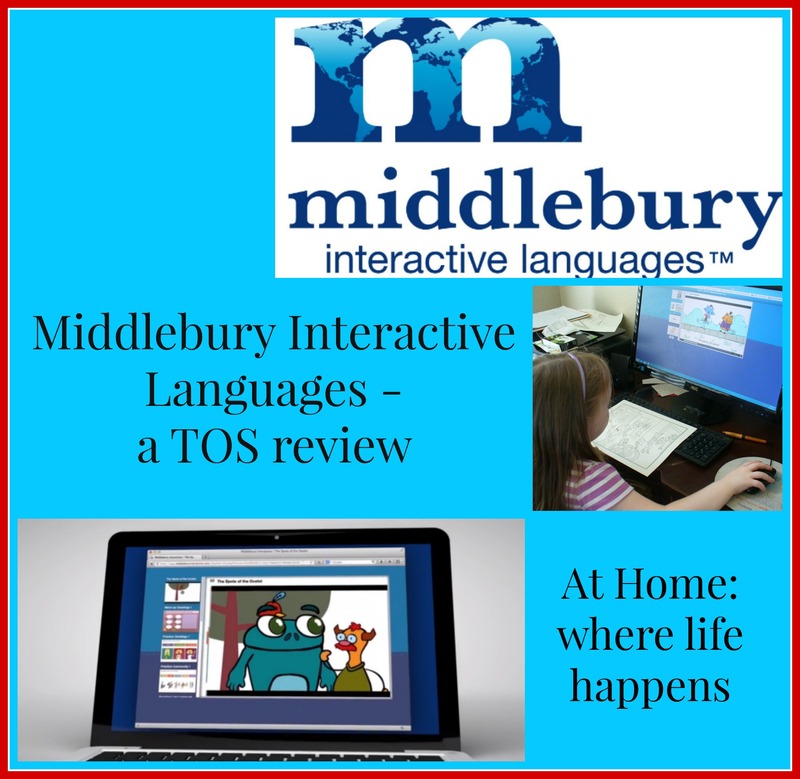 To find out about other courses offered by Middlebury Interactive Languages, please visit the TOS Review Crew blog by clicking the banner below.